Harper had her 9 month check-up today. I was just thinking that I was pregnant with Harper for 9 months and now she has been alive for 9 months. I'm not sure which one seemed longer. My pregnancy went by so fast but I think these last nine months have been LIGHTENING fast! Isn't this dress precious? I had it made a LONG time ago - ordered it off etsy. It's reversible. The other side is polka dot and also has her name on it. I'm sure she'll be sporting it on here soon! I just love the little monkey. It seemed so big when I bought it and when I pulled it out today it was already almost small for her. We had to wait a while in the doctor's office and we both got stir crazy. So I took our picture! I had play group today but missed it because we got out of the doctor too late. I missed my play group friends! :-) But guess who took a WONDERFUL morning nap and is in the middle of an afternoon nap? After ELEVEN hours of sleep last night! Praise God from Whom all Blessings Flow!!!! Today is National Miscarriage and Child Loss day. If you have lost a child - I'm thinking of you today. I had a very early miscarriage but that is nothing compared to the pain so many of you have been through. Angie Smith is having a day of remembrance - you should go and visit! So glad Harper is better and no more ear infection! She is just ADORABLE! I lover her dress! Too cute. And she's pretty cute too! Can't wait for tomorrow and getting to see lots of creativity. Yay for a healthy report! Ok let's see, 50% in weight, 75% in height, 90% in head...you forgot 100% in overall adorableness, smartness, and I-just-want-to-squeeze-her-ness. Dress...ADORABLE!! This entire month is actually Prenatal and Infant Loss Awareness month...many don't know that because it is also Breast Cancer Awareness Month and that seems to take the "lime light" if you will. I usually do a post about Prenatal and Infant Loss Awareness Day....need to do that. My daughter is also 9 months and in the 50% for weight, 75% for height and 90% for head circumference. I agree, lots of room for brains! What a little sweetie pie! I can't believe how big she is getting! Praise the Lord for sleep! I am so glad you got to rest up, and Harper is well! Harper looks PRECIOUS!!! I love the tunic/dress (I can't tell which in the picture) you have on too! Glad to hear to Harper's ear infections are gone and that she is doing well. I am also thinking of all the woman who have lost babies. I'm glad Harper is doing well and sleeping better. Mine goes in for her 4 year check up next week! If you think the first 9 months goes by fast wait until she's 4 and your waiting to pick her up from kindergarten! SOOOO cute! 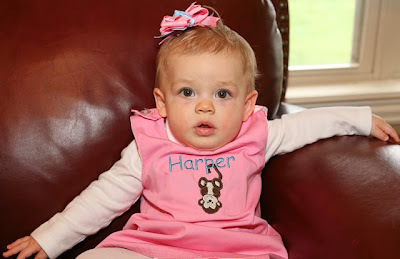 Harper is adorable, as always! I can def. see her daddy in her, but in that first picture, I see YOUR dad in her! Kelly i am so happy to hear little Harper is doing so well! You are right Time has gone by SO FAST! I have been a reader for 8 months now and i just LOVE YOU and your family. I love how you are always at peace and how much you lift up and praise our God. Well... I accepted Jesus and welcomed him into my heart Sunday at church! I have NEVER felt such joy and happiness before! I did it because i wan to have peace with myself change my attitude, but i didn't because i Long for a relationship with God. People at my church told me that when you choose to follow God your life not only changes and your heart changes but the devil also works 10x harder against you! Well i am ready! I know that God is with me 100% and will never forsake me! I just had to share the great news! So very thankful for a great check-up and also thankful she rested last night and again today. Praying for all families who have suffered through loss. Congratulations on such a good report from the doctor! You can tell she is so smart, she looks like she has a "to do" list running in her mind. I just love little monkey clothes! My sister sews and has a little burp cloth that has a monkey on it and says Daddy's Little Monkey!! Yay for Harper's Ear Infection being GONE! THAT IS AWESOME NEWS!!!!!!!! I pray you find God's peace and joy in your life! My daughter notices that Gracie (also 9 months) sleeps better and longer when she has already slept well...when she takes good naps, she sleeps better at night and vice versa. I just wanted to share this with you and say thank you. 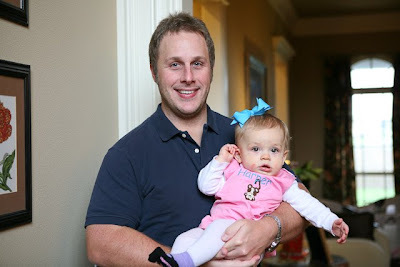 I love your blog - Harper is so cute and you are such a sweet and loving mother. I think about your story OFTEN and it reminds me to appreciate and love my little 2.5 month old fella! I got married November 8 and though we have always wanted kids, I did NOT expect to have my first baby 9 months after our wedding! Whenever I am feeling exhausted or overwhelmed with all that comes along with a new baby, I think about you and all the other women out there who have to fight so hard to have a baby. It reminds me to be so grateful that we got pregnant so fast, and it reminds me to cherish every second with my little boy - even the tough ones. What a cutie pie! That dress is absolutely adorable, love it! According to the book Healthy Sleep Habits, Healthy Child by Marc Weissbluth, the more a baby sleeps, the more he / she will want to sleep...so it's not surprising that after an amazing night of sleep last night that Harper is napping like a champ today! I hope the streak continues...keep giving her the right opportunities to sleep and she will keep right on sleepin! Congrats on 9 months and a great checkup! I would seriously expect nothing but good reports where Harper is concerned! And how cute is she in that dress! But then again, her momma is pretty adorable herself :) Must run in the genes!! Love you! Great report. She's a healthy happy little girl and I'm so glad for you that she's sleeping better! Her monkey dress is so cute!!! I am excited for tomorrow's post. Adorable dress! That's great about her being better and a great checkup! I'll have to link up for 'Show Us Your Life' real soon. I actually am starting a business which will be featured on my blog, but won't have time to post and take pics, yadda yadda. Maybe next time! If it makes you feel better when I took my daughter to her one year check up her head measure in the 100%. I asked them if they seriously thought that my baby girl had the biggest head of all one year olds!! Now they just write >95%... I think they are trying to make me feel better! :) But the doc always says it is because of her smart brains! Smart girls!!! wow, i can't believe harper is 9 months old. but then i can't believe my baby girl is 1 year old! we were at her one year check up today and she weighs 17 lbs 11 oz (0%), 30 inches (75%) and her head was in the 75% and my doctor said the same it is because she is so smart too!! i am amazed at how our God makes our babies so uniquely different and they are so beautiful to us and to Him. happy happy 9 months to your baby girl! Yeah! Glad that Harper is finally sleeping again. We have gone through brutal teething and ear infections, so I feel your pain. So happy to read another healthy baby report! Thanks for letting us know it is National Miscarriage and Child Loss day. I have a new e-mail friend I met through an online pregnancy group who just miscarried, and I am glad I was able to e-mail her with more prayers and words of support! Thanks for mentioning the Infant Loss Day---my candle is shining bright right now for my daughter Jillian. Your little Haroer is just adorbale! I did not know that this was National Miscarriage and Child Loss Day. Thank you for posting about this. My heart and prayers go out to all men and women who have experienced this tragedy. 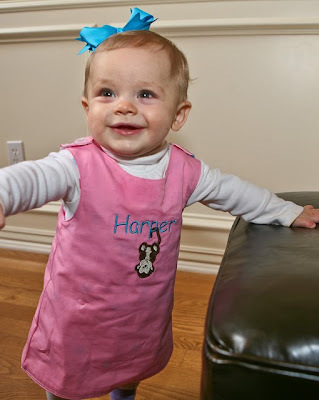 Glad to hear that miss Harper's ear infection is gone! My little girl who is six weeks older than Harper is also in the 50%tile for weight 75%tile for height and 90%tile for head circumference! People always told me how fast kids grow up, but I didn't really understand until I experienced it myself. I have learned to enjoy every single minute! Adorable as always! My first born 'baby' graduates from college this year...how is this possible??? 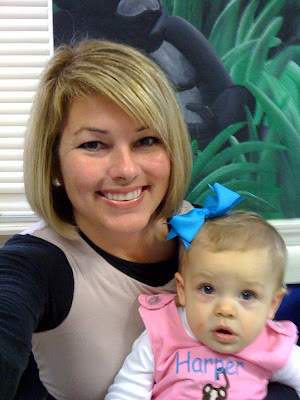 Wasn't I just at the dr. with her for her 9 month checkup? I've been following you since Harper was born, but I never realized you had a miscarriage. I found out I had miscarried on Monday and had a DNC on Wed - what would have been my 9th week. It's given me so much comfort reading about so many women who have gone through this before. Thank you for always being so encouraging in everything you write.